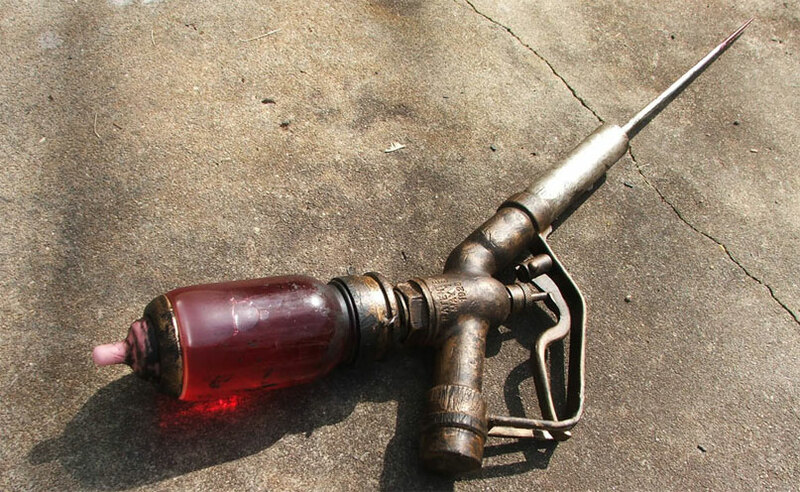 Crazy idea, right? But wait — the guy who founded PayPal, Peter Thiel, thinks this is a really good idea! In a piece he wrote for Cato Unbound (because, you know, the Cato Institute is usually so restrained), he describes the three places we need to go in order to become truly free as money-lusting capitalists. Because there are no truly free places left in our world, I suspect that the mode for escape must involve some sort of new and hitherto untried process that leads us to some undiscovered country[...]. Number one is cyberspace. Okay, fine. I guess. He started PayPal and it’s a pretty handy thing. I don’t understand how people can escape into cyberspace to evade the “unthinking demos” that are ruining the world, but whatever. Number two is outer space. I swear to Jebus I’m not making this up. “We must redouble the efforts to commercialize space”, he advises. Can you imagine? Big satellites advertising McDonalds when you look up at the night sky. Sandals: The Moon. Woooo! Number three is what he calls “seasteading”. That’s right — let’s build ourselves a Rapture! Seriously, read it for yourself. To my mind, the questions about whether people will live there (answer: enough will) are secondary to the questions about whether seasteading technology is imminent. From my vantage point, the technology involved is more tentative than the Internet, but much more realistic than space travel. We may have reached the stage at which it is economically feasible, or where it soon will be feasible. It is a realistic risk, and for this reason I eagerly support this initiative. I mean, wow. It’s not enough that he was worth $1.2 billion in 2008 (and probably more today). He needs to get away from those darn taxes that would pay for poor kids to get health care! Fascism! Glenn Beck is right! This is the sort of people we have in mind when some of us radicals support the idea of taxing the rich. They have the money, people! They just refuse to share it with the rest of us. And they’re willing to flee into outer space, or beneath the ocean, in order to keep all their toys to themselves. Nicholas Kristof wrote an interesting piece in the New York Times recently about our occupation of Afghanistan. I encourage you to read the whole thing. UPDATE: 60 Minutes reported recently on Mortenson’s activities and some of the questions around how truthful his claims are. Sheds some unsettling light on the claims he and others have made. If you’ve never seen the Powers of Ten video, have a look. Sciencey coolness from 1977. Today I’m listening to: Dam Funk! Update! WBC is officially in the game. I recently found “Jesus Lean” via The High Definite. It joins “Baby Got Book” and “Christian Side-Hug” as gruesome jaw-dropping examples of rap music in the service of proselytizing the Christian gospel. First of all, I’ll say that I am not a Christian myself, but not because I disagree with the core of Jesus’ teaching. I’m right on board with turning the other cheek as a way to show love to one’s enemies and help enlighten them so we can escape the cycles of despair and self/mutual destruction. I also agree with finding the divine by serving the poor and working to eradicate needless suffering, starvation, etc etc. So I dig Jesus’ teachings, but I can’t go along with all of them. Same with Islam — I like the emphasis on justice and unity among the believers, but I can’t swear off other cool gods, like Ganesha and Altin (don’t ask). I consider myself something of a polytheist, trying to find the true divine among all the many beautiful traditions of human worship (although I haven’t found much beautiful in Satanism) while speaking critical truth to the damage done by misguided people in the name of each faith. I could spend all day writing about my religious perspectives, but that’s not what I came here to do. Topic for another time. Too much dogma. For decades I’ve been a fan of the industrial/hip-hop inspired group Consolidated (now defunct — thankfully, since the last two albums were really weak). They always went way overboard with the in-your-face message on tracks like “Tool and Die”. (See if you can figure out what their message is there!) I love the clarity of their message (which I almost always agree with), but I also understood why many people rolled their eyes as soon as I started playing them.Now that I’m no longer a rabid “the people need to know! !” type of person (well, less of one), I appreciate the need to balance the message and the sound. (I’ve always loved Consolidated’s sound, however.) 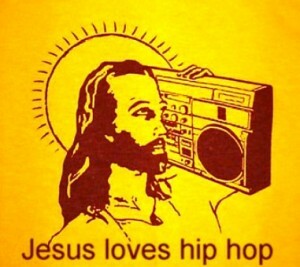 Songs like “Jesus Lean”, alas, push the point wayyyy out in front of the sound, and drown out everything else. Moreover, each song brings with it a dense (and, I feel, creepy) set of assumptions that have more to do with fundamentalist devotion to a set of rituals and practices than living a good life and loving one’s neighbor as oneself. Borrowing the background. Somehow I get the feeling that the young people in these videos never really listened carefully to the lyrics of Public Enemy or Boogie Down Productions. And yet the look and sound of “Christian Side Hug” comes almost directly from the S1Ws: sirens, gunshots, abrasive noises. PE used these sounds not (only) because they were exciting and gritty, but because they were (and are) a sonic representation of oppressive systems that deserve vigilant resistance.Using these aesthetic elements (and the same goes for the “dirty south” sound of “Jesus Lean”) without any connection to the social, political, or cultural traditions that nurtured them feels really dishonest. They seem like modern-day versions of Paul Whiteman, taking all the soul and guts away and re-creating only the most surface-level elements of the music. One thing I can’t really criticize is the racial dynamics of these “artists”. It’s pretty striking that “Jesus Lean” features first a bunch of white kids, and then a bunch of black kids, and then a trio of black females, and then a middle-aged white lady shopping at Wal-Mart, and then a white police officer (who appears to appear non-ironically). And many religious communities preaching evangelical Christianity are lily-white. I have no idea where that picture up top comes from. It appears on lots of websites — I couldn’t find an original source. And now for a really good hip-hop song: “New World Water” by Mos Def. Today I’m listening to: Rob Viktum! 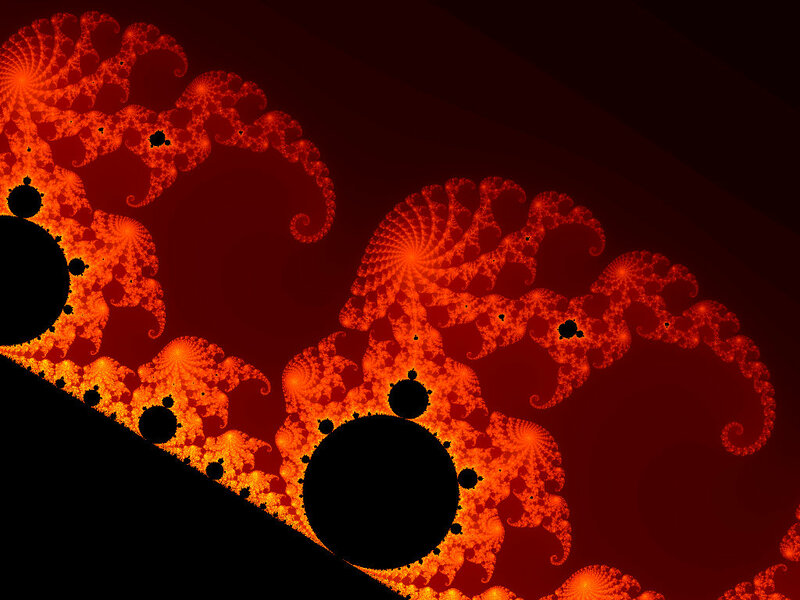 Benoit Mandelbrot died last week. He brought us an awesome world of cool images. 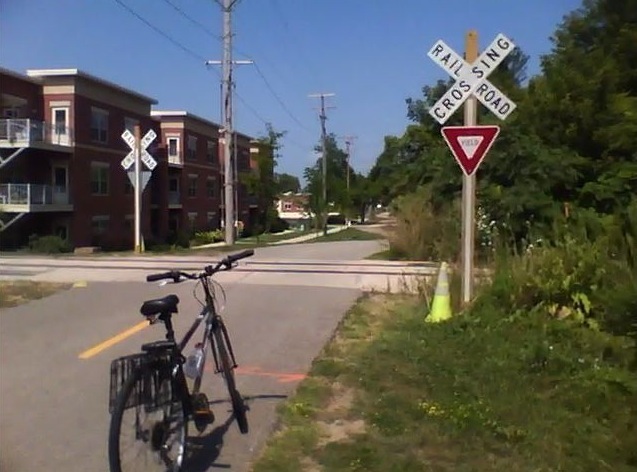 Yeah, because I was expecting the train to yield to me on my bike! Also: Mike Konopacki (whose niece I once taught) did a comic about The Simpsons’ animation outsourcing back in 1993 (although apparently it’s not online). Mad in USA, Kerr Comics. This is not a new issue. It just took a show with the clout and sociopolitical capital like The Simpsons and an artist with the guts of Banksy to shove it in America’s face. And — what a shock — it makes us uncomfortable. Well, tough [bad word], people. Welcome to the realities of free-market fundamentalist global capital. Go read Ho Joon Chang’s Bad Samaritans and watch the documentary film The Corporation before you start pretending like this is beyond the pale. Art at its best holds a mirror to society and shows us what we might like to ignore. Like Colette said: “Look at that which pleases you for a long time. And look at that which displeases you for a longer time.” I’m sorry if it’s better to retreat into our mythological fantasyland of “Oh I buy the Salvadoran coffee at Starbucks so I’m making a difference in the world economy” — thanks, Zizek — but the truth is that this stuff requires systemic change and we’re not going to overcome slave labor (excuse me, near slave labor) by individual consumer choices.